Kenneth and Ellen Chessick receive awards from the NIU College of Law. With them are Kenya Jenkins-Wright, left, president of the college’s Alumni Council, and Dean Jennifer Rosato, right. The Northern Illinois University College of Law Alumni Council recently honored two of its most generous donors and passionate advocates. 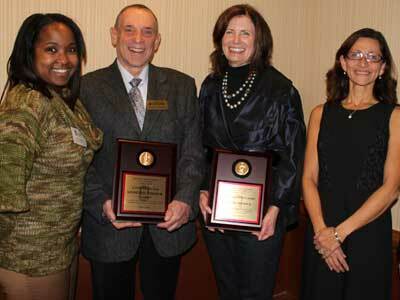 Kenneth (’84) and Ellen Chessick were honored in December at an NIU Law reception held at Chicago’s Sheraton Hotel. Hosted by Dean Jennifer Rosato and the NIU Law Board of Visitors, the event took place during the Illinois State Bar Association’s Midyear Meeting. Dr. Kenneth C. Chessick was named Alumnus of the Year in recognition of exceptional career achievements, devotion to the public good, and devotion to the College of Law. He is a trial lawyer, a general surgeon and CEO/chairman of the board of directors of Restaurant.com, a major internet marketing company benefitting consumers and restaurants nationwide. Chessick founded his law firm, the Law Offices of Kenneth Chessick, M.D., in 1984. The practice concentrates in medical and hospital negligence and personal injury, representing catastrophically injured victims in Illinois and Nevada. The Chessick firm has achieved record verdicts at trial and settlements in excess of $100 million. He is a member the NIU Law Board of Visitors as well as the NIU Foundation Board of Directors. In 2001, he was named the Distinguished Alumnus of the Year. Ellen Chessick received the Honorary Alumna Award, recognized for professional integrity and extraordinary commitment to the College of Law. 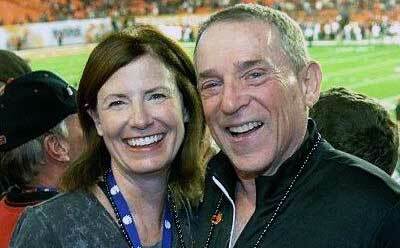 The Chessicks cheer on the Huskies in the Orange Bowl. A native of Chicago and an ardent NIU Huskie fan, she is financial manager and vice president of strategic growth with Restaurant.com. She earned her bachelor’s degree in finance from the University of Illinois at Chicago and has an MBA in finance from DePaul University. Her volunteer service also includes co-chairing the NIU Foundation’s Red & Black gala, NIU’s premier event showcasing faculty, staff and students. Her Huskie pride is evident in her commitment to the success and advancement of NIU in every area: academics, athletics and in the community. As volunteer and philanthropic leaders, the Chessicks seek to provide those at NIU and the College of Law every opportunity to be successful as lawyers and business professionals. The state-of-the-art Kenneth C. Chessick Legal Training Skills Center opened in 2004. They have also established student scholarships including the Kenneth C. Chessick Civil Justice Endowed Scholarship Program and the Kenneth and Ellen Chessick Bridge to the Bar Scholarship Fund. Most recently, the Chessicks pledged $3 million to NIU athletics for the Kenneth and Ellen Chessick Practice Facility. This gift is the largest ever made to Northern Illinois Athletics and the second-largest gift to the university. The Chessicks are part of a distinguished group of honorees recognized by the NIU Law Alumni Council for their career accomplishments, devotion to the public good and continued service to the law school. This year’s group of illustrious honorees came from the public and private sectors and are all dedicated to the communities they serve. Other award recipients were honored this past summer during the NIU Law Golf Outing and Awards Dinner.